Syrup: An additional source of L-carnitine and B-complex vitamins. 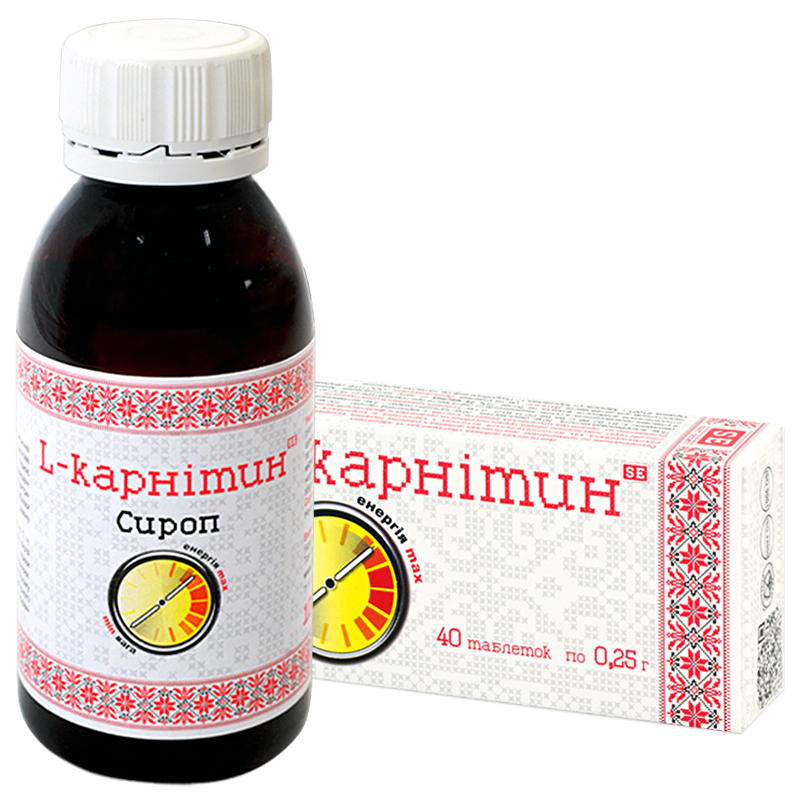 It promotes improvement of metabolic processes general work capacity of the body and its physical endurance, attention concentration and memory. Tablets: An additional source of L-carnitine and vitamin complex; it helps improving general work capacity of the body and its physical endurance, eliminating toxic substances from the body. Syrup: L-carnitine tartrate – 10.0%, flavor – 1.0%, stevioside – 0.5%, sodium benzoate – 0.2 %, Vitamin B3 – 0.1%, Vitamin B6 – 0.01%; Vitamin B12 – 0.00016%, deionized water – up to 100.0%. Tablets: L-carnitine tartrate – 100 mg, ascorbic acid – 50 mg, magnesium oxide – 20 mg, vitamin complex (vitamin E – tocopheryl acetate, thiamine mononitrate, riboflavin, pyridoxine hydrochloride, ascorbic acid, calcium-D-pantothenate, folic acid, nicotinamide, d-biotin, cyanocobalamin) – 0.1 mg, excipients. L-carnitine consumption before physical loads reduces lactic acid accumulation (i.e. reducing fatigue threshold), whereas its consumption thereafter relieves pain in the muscles. Introduction of L-carnitine to the diet promotes increase of body’s endurance, support of cardiovascular system functioning, reduction of subcutaneous fat, quick body recovery due to improvement of metabolic processes in the body and elimination of toxic metabolic substances from a cell. B-complex vitamins act as catalysts of numerous biochemical processes in the human body, help boosting body defenses, reducing the effect of aggressive environmental factors. Vitamin B3 (nicotinic acid) improves carbohydrate metabolism, has positive effect in case of liver, heart diseases, has vasodilating effect, and hypolipidemic activity. Vitamin B6 (pyridoxine hydrochloride) improves functional state of the central nervous system, takes active part in the metabolism of some amino acids, processes of lipid metabolism. Vitamin B12 is necessary for normal hematopoiesis, has positive effect on the liver and the nervous system function, activates carbohydrate and lipid metabolism. Ascorbic Acid is a water-soluble vitamin and a powerful antioxidant, playing a significant part in carbohydrate metabolism, lipids and proteins synthesis, aerobic respiration, regulating oxidation-reduction processes. It is necessary for intracellular collagen synthesis and is required for healthy teeth structure, bones and capillary walls strengthening, promotes body resistance to infections. Vitamin complex (vitamins E, B1, B2, B6, B12, C, calcium-d-pantothenate, folic acid, nicotinamide, d-biotin) acts as a catalyst of numerous biochemical processes in the human body, promotes immunity boosting, mitigating the effect of aggressive environmental factors. Syrup: Adults take 1 teaspoon (5 ml) thrice a day with food or after meals. Sportsmen take 1-2 tablespoons (13-30 ml) immediately before training. Term of use – up to 1 month, further, the term of use and the possibility of repeated use are to be agreed with a doctor. Tablets: Adults take 1-2 tablets twice-thrice (1-2 capsules twice) a day with food, wash down with water. Term of use – 3 to 6 months. Syrup: Proteins – 0 g, carbohydrates – 2.989 g, fats – 0 g.
Tablets: Proteins – 4.25 g, carbohydrates – 0.4 g, fats – 6.7 g.
Syrup: 100 ml and 1000 ml bottle. Tablets: 250 mg tablets N40 and N80.